If you rooted your Oneplus 3 and used some custom ROM on your phone. You then realise that you’ve got an issue with the phone, and Custom ROM is working for you and forgot to make a nandroid backup of Your Oxygen OS Oneplus 3 Stock ROM. Now want to Return to 100% Stock on OnePlus 3. But no idea how to do that and how to install the Latest Stock Oxygen OS firmware on the Oneplus 3. Not to fear, this guide is for you! There are so many benefits of Flashing the Stock ROM on Oneplus 3. Flashing Stock ROM will solve all the issues that you faced in the Custom ROM. You can receive the OTA updates on the Phone. So Stock on OnePlus 3 is a must for all those users who are facing so many problems in the Oneplus 3 and revert to Stock or Factory state. Today, we’re going to show you how to restore the OnePlus 3 to stock. No need to install any third party application or tool to flash the Oxygen OS firmware on the phone. You can do this easily wit the help of the Custom Recovery of Your phone. All you nee the latest Oxygen OS zip file and some time to flash the ROM on your phone. If it’s possible, do take the backup of your device. This process will wipe your data. b) Device battery charged to at least 60 percent. c) And a Cup of Coffee. 🙂 Just Kidding. This guide will work for both rooted and non-rooted user with TWRP or Stock Recovery. Step 1. Download the ZIP file for the latest version of Oxygen OS from the above mention line and save the zip file on your phone’s internal memory. Step 2. Now switch off your phone and wait for five secnds, Boot your phoine in reocvery mode. Read here how to boot oneplus 3 in recovery mode. Step 3. Once you are in recovery mode. If you are on Stock Recovery, Tap Wipe data and cache. TWRP user, Go to Wipe > Advanced Wipe > Wipe Cache, Dalvik, and Data. Step 4. Now all you have to flash the Oxygen ZIP file on your Phone. If you’re on TWRP, navigate to Install and select the OxygenOS ZIP file. On stock recovery, select Install from Local and select the ZIP file. Step 5. Now the flashing process will start on your phone and this will install the Stock Version of Oxygen OS on your Phone. Step 6. Once the installation process is completed in the recovery. Reboot System. If you want to go back to the Stock Recovery of OnePlus 3. Read the full instruction here. Now your phone will return to the stock state. 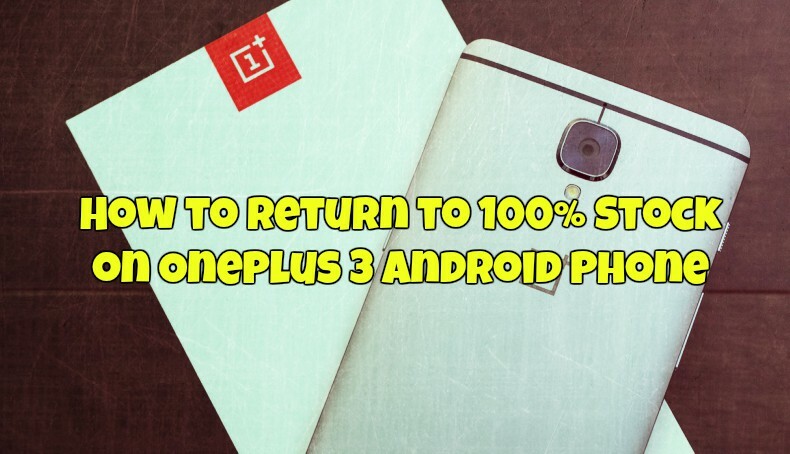 Hope you like this Return to 100% Stock on OnePlus 3 guide. If you have any questions or facing some difficulties, contact us by leaving the comments below. Hey. I have followed your instructions strictly and in stock recovery I can’t find “install from local”. All I see is “install from ADB”. Please help!